Butternut Squash Recipes Archives - THE OLIVE BLOGGER - Recipes your family will love! Here is a real stick to your ribs meal for the cooler days ahead! A simple and delicious Butternut Squash Risotto! 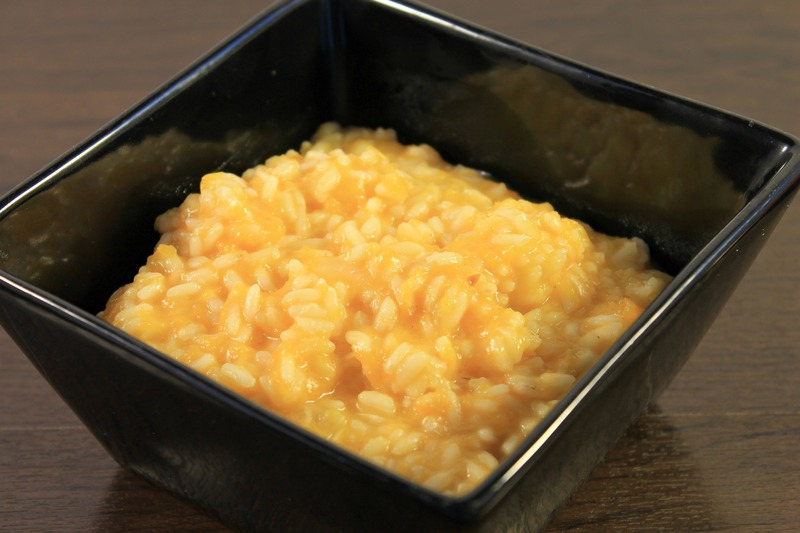 I know most people are intimidated when they see the name…RISOTTO! Ahhh! But guys, calm down, it may look and taste like it was made at a 5 star restaurant but I assure you this recipe is VERY simple! You just need to ensure that the level of heat stays consistent and that you stir constantly and you will come out with a delicious risotto every time. I love adding new recipes to my Fall line-up, I mean you can never have enough comfort foods in your recipe box right?! Most people will think of soups and stews for a classic comfort food, like my Hearty Sausage and Kale Soup (go on, check it out and make that this week too…it makes a ton so you can have leftovers) but I think you will start to add in this risotto once you have had a taste. One of the amazing things about this recipe is that you can really customize it to your mood and what you have in the fridge. Want Asparagus Risotto instead? Sure, no problem, cut and steam the asparagus and throw it in. Wanna make it a Mushroom Risotto? Yep, go ahead, do a quick satuee to the mushrooms of your choice and add em in! Do you see the pattern? Now this recipe is ESPECIALLY delicious as it features one of my favorite Fall ingredients- Butternut Squash. Oh ya, I can see you drooling already! The flavor from the nutty butternut squash combines with the creaminess of the risotto to make a show-stopping dish. And thankfully it makes enough to serve 6-8 people so you can go back for seconds! (Trust me, you’ll be sneaking spoonfuls as you pack up the leftovers). 6 c Vegetable Stock we use the stock cubes a mix our own, more cost effective!! 2 c Arborio Rice make sure it says Arborio and NOT Italian! Prepare your squash (steam and mash) and set aside for later. In large pan melt butter over medium heat, add in onions and a pinch of salt. Allow to sweat until they are almost translucent. Add in garlic and stir, add in your rice to toast (about 2 minutes) make sure you are stirring from here on out! Add wine and stir until completely absorbed. Reduce heat to medium-low. Now you will begin to add your broth a couple of ladles at a time. You want to add enough to cover the rice, and make sure you are stirring constantly to absorb. Repeat the above step until your broth is gone or your rice is no longer crunchy (about 30 minutes...This will create the creamy consistency everyone loves with risotto! Lastly, add in your mashed squash, parmesan and the lemon zest. Stir until everything is mixed. Add more salt and pepper to taste. Okay, so remember I said it was very easy to make and you just had to keep a couple things in mind? Well let’s go over that again just to make sure you get the perfect risotto the first time! Heat consistency is KEY! You will want to use a heavy bottom pan to keep the heat even throughout the cooking process. This goes for your pot that is simmering with your broth too! Stir, stir, stir! Make sure you use a good wooden spoon for this! Why? Well it will not conduct heat, meaning it is neutral in your pan (doesn’t mess with the heat consistency mentioned above). You can also use a silicone spatula if you prefer, but I love the feel of the wooden spoon for stirring the risotto, it really moves it around! Milkiness is key! Once you add your liquid (which you add slowly) you want to see the milky starch as you stir. This shows that you are doing it right, and your risotto is coming together perfectly. You don’t need a $40 bottle of wine! People often skip over recipes that call for the use of wine as they think they need to go out and buy an expensive bottle just to dump into their dish…now, yes there are SOME dishes where you want to do this (where the wine is really the star flavor maker) but not in this case! Do you know what we do? Open the fridge and grab whatever dry white wine is sitting there from our last date night…yep! Well guys, that’s it! I told you it was a simple dish to make! You won’t believe the flavors in this one when you make it. And guess what? It is even BETTER the next day! Enjoy! This post contains affiliate links which cost you nothing more but allow you to see the tools I prefer to use in my own kitchen!